Every year the rivalry between England’s two most famous universities is enacted on the waters of the River Thames. The Boat Race is a curiously English affair involving a strong sense of tradition, sporting prowess, fair play, teamwork and willpower. Oar blades flashing in the sunlight, the light blue of the Cambridge University crew and the dark blue of Oxford University crew row alongside each other: two shades of blue muddying the waters. In many ways, the detective fiction of Oxford and Cambridge has followed a similar course: over the past decades, the crime writing tradition (where sense of fair play is paramount) has developed alongside the mapping of an “Oxbridge” landscape. Whilst both Oxford and Cambridge sit astride rivers, they occupy very different landscapes. The towers and spires of Cambridge rise above the mysterious fenlands of East Anglia: wide skies over a fertile flatness so familiar to Dorothy L. Sayers. Oxford’s backyard consists of rolling hills and patchwork fields: archetypically English countryside dotted with the chocolate box villages of the Cotswolds. The rivers are different too. The Cam is a hugely popular city centre tourist attraction offering unrivalled views of the Cambridge colleges. In Oxford, the rivers Cherwell and Isis (the Thames, flowing eastwards from the Cotswolds) meet south of the city centre. It is the canal, with all its industrial heritage, that is more representative of the landscape here. The waterways of both cities supply the settings for two excellent modern detective novels, written with an unerring eye for detail and an utterly convincing sense of place. Elizabeth George visits Cambridge in her intelligent and poignant mystery For the Sake of Elena (1992). When a student is murdered on the mist-shrouded riverbank, Inspector Lynley investigates in and around the fictional Cambridge college of “St Stephen’s” (squeezed between real-life Trinity College and Trinity Hall and modeled on the latter). Colin Dexter won the Crime Writers’ Association Gold Dagger for his complex and superbly crafted The Wench Is Dead (1989). Inspector Morse is laid up in hospital but, ably assisted by his long-suffering sidekick Sergeant Lewis, still tackles a Victorian murder mystery set on the Oxford Canal. Whilst donnish detective fiction revels in the intricacies of academia—its Common Rooms, conventions and floor plans—it has always offered a window out of the quadrangle as well. To Edmund Crispin (pseud. of Robert Bruce Montgomery), Oxford was “of all the towns of England, the likeliest progenitor of unlikely events and persons.” In Crispin’s classic murder mystery The Moving Toyshop (1946), Richard Cadogan arrives here in the middle of the night: “Through a rift in the trees he caught his first real glimpse of Oxford—in that ineffectual moonlight an underwater city, its towers and spires standing ghostly, like the memorials of lost Atlantis, fathoms deep.” The location of the fated toyshop might pose problems for Cadogan and don-detective Gervase Fen (based on Crispin’s Oxford tutor), but the atmosphere and loving descriptions of the city are spot-on. With classic mysteries from J C Masterman’s An Oxford Tragedy (1933) to Robert Robinson’s Landscape with Dead Dons (1956), Oxford can rightfully claim the crown to donnish detective fiction. Few women were able to enter these bastions of male learning—though Dorothy L. Sayers, who was born in Oxford, returned here in 1912 to study French at Somerville College. Having created her impossibly pompous aristocratic detective Lord Peter Wimsey and then romanced him with novelist Harriet Vane, Sayers brings the relationship to a head in her nostalgic mystery Gaudy Night (1935). If you take a walk under the Bridge of Sighs towards New College, you’ll find the spot where Lord Peter and Harriet finally embrace, under the eye of the Warden’s Window, a tiny opening over the New College “bridge” above New College/Queen’s Lane. The oldest college at Oxford University, Merton, traces its roots back to 1264. This date coincides with the setting of Falconer’s Crusade (1994), the first book in the medieval series by Ian Morson. It was the “sense of layers of time” shifting together in the present that inspired Morson to set his historical mysteries within the walled mayhem of 13th century Oxford. Students were then notorious for their rowdy, drunken behaviour and frequent altercations with the locals. Falconer is often to be found traipsing through muddy backstreets, being jostled by crowds and narrowly avoiding riots—and trying to bring Aristotelian logic to bear on the unruly, smelly and noisy landscape of medieval Oxford. Before turning to the brooding, psychological crime novels that are her hallmark, Margaret Yorke created a short series of more conventional detective mysteries featuring Inspector Patrick Grant of Oxford CID. 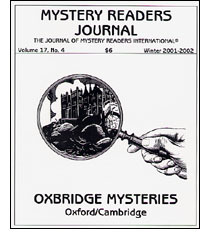 Yorke had spent many long hours working in the libraries of Oxford’s all-women’s college St Hilda’s and Christ Church, and penned the article “Oxford vs. Cambridge: The Dark Blues Have the Most” (in Murder Ink: The Mystery Reader’s Companion, 1977). But quality, rather than quantity, counts most. What Oxford has that Cambridge lacks, is, quite simply, Inspector Morse. Which isn’t strictly true now, of course, as following The Remorseful Day (1999) Oxford no longer has a Morse either. Colin Dexter’s hard-drinking, crossword-solving, penny-pinching, opera-loving, introspective loner Inspector Morse, is one of the most enduring of modern-day detectives. But can you really imagine Morse anywhere other than Oxford? Aided and abetted by a highly successful television series, Dexter doesn’t disguise Oxford, doesn’t just use the city as a backdrop, he delights in the place; its history and heritage, colleges and canals, pubs and shops, local amenities and tourist attractions. For the literary tourist, the beauty of Dexter’s Byzantine mysteries is that you can actually follow Inspector Morse on each case: whether having a drink at the Randolph Hotel (dare you stay in Room 310?) or finding The Way Through the Woods (1992) at Wytham. The city is real, and Morse is therefore real: the perfect example of character and landscape in harmony. After terrible riots between the Oxford townsfolk and the University in the early thirteenth century, a number of students fled eastwards to Cambridge, then just a small town on the edge of the fenlands. In a short time the University was formed and the first college, Peterhouse, started here in 1284. Medieval murder and mayhem was never far behind, as former police officer and Cambridge Ph.D. holder Susanna Gregory (pseud.) would tell you. Gregory’s atmospheric 14th century series features independent-minded physician Matthew Bartholomew of Michaelhouse College (once a real college, but long-since absorbed into Trinity, Cambridge’s largest college). During his investigations, Bartholomew uncovers a conspiracy among the town’s traders to close the university down and is drawn into confusion when the foul-smelling waterways surrounding Cambridge are drained. If you climb the tower of St Mary’s Church (which provides some of the best views over Cambridge), you might try to imagine Gregory’s medieval Cambridge students bursting out of the church door singing bawdy songs. Many of Oxbridge’s detective landscapes are amalgams or inventions imbued with the atmosphere and characteristics of places usually well known to their creators. Cambridge-born and educated Douglas Adams, best known for The Hitchhiker’s Guide to the Galaxy (1977), provides bizarre, hilarious and darkly clever detection in Dirk Gently’s Holistic Detective Agency (1987). Private investigator Dirk Gently sets out on the trail of a murder enquiry back through the 12th century gates of his alma mater: “St Cedd’s College.” Named after “one of the duller Northumbrian Saints,” St Cedd’s is a composite of academic and architectural ambiguity: “a ghostly profusion of buildings thrown up over the centuries, medieval next to Victorian, Odeon next to Tudor.” One of the greatest challenges here is trying to find an escape from Cambridge’s treacherous one-way system, but when Gently traces a form of time machine to the college rooms, the solution to the murder lies in sight. In her fiction, James often explores institutional landscapes; this is also true of Ruth Dudley Edwards, whose favourite novel, Matricide at St Martha’s (1994), takes the fallibility of academia to hilarious extremes. The colleges are only one of the landscapes of “English Establishmentland” satirised by this Anglo-Irish writer (educated at Cambridge) in her series featuring the larger-than-life Baroness Troutbeck, outrageous Mistress of Cambridge’s “St Martha’s College,” and the drifting observer Amiss. When crime writer Michelle Spring first arrived in a “claustrophobic” Cambridge, it struck her as “a very small town dominated too much by the university.” Nowadays Spring loves the proximity of the river running through the centre, and the green spaces Cambridge offers. Through her Laura Principal mystery series, the Canadian-born writer has created an engaging vehicle for social commentary of a rapidly changing city whose surrounding region, “Silicon Fen,” is one of the fastest developing regions in the UK. The river is a frequent metaphor in Spring’s work and the “shimmering, watery echoes in the Cam” of the colleges are often less than reassuring. For a taste of Laura Principal’s landscape, you might take a walk along the towpath at Chesterton or across Grantchester Meadows, imagine “St. Bartholomew College” on Midsummer Common—or take out a boat on the Cam; this is what Laura Principal does to clear her mind, attuning her body to the boat’s rhythm, and to the sounds of the river. The results of the Boat Race have been more or less even since its inception in 1829. In crime writing, the dark blues once had the edge, but in recent years the light blues have been making headway. The landscapes of detective fiction don’t always run still or deep, but a trip along the Cam, Thames or Cherwell rivers into the “wilie-beguilies” of Oxbridge landscapes old and new is a literary treat that really shouldn’t be missed. Long-term “partners-in-crime” Julian Earwaker and Kathleen Becker are the authors of the forthcoming illustrated guide Scene of the Crime—A Guide to the Landscapes of British Detective Fiction (Aurum Press, London, August 2002). The first novel I ever wrote was set in Oxford. Luckily for my reputation, nobody has read it apart from the couple of dozen publishers who had the good sense to reject it back in 1977. It was set in Oxford because I’d just completed three years at St Hilda’s College and this was my great roman a clef, dealing with all the big subjects—love, death, grief, revenge, bigotry and punting—with all the maturity that only a 21-year-old can bring to literature. By the time I realised that I was of criminal bent, the Oxford years looked very different. I’ve never set a crime novel in the shadow of those scheming spires, though I do have the kernel of an idea for a thriller with its roots there, inspired by a bizarre encounter at a St Hilda’s Mystery Conference. I’m not quite sure of the reason for my reluctance to write about Oxford, unless it’s the abiding conviction that Colin Dexter has done it so well that he has rendered it untouchable for the rest of us for some time. However, I did make it the home town of my Manchester-based private eye Kate Brannigan, whose Oxford is very different from that of Morse. She grew up in a blue-collar environment in East Oxford, where her father worked on the production line in the Rover car plant. I have it in mind to allow Kate to go home one of these days, though probably just for a short story rather than a full-length novel. But perhaps the reason for my strange lack of enthusiasm for using Oxford as a backdrop has more to do with me. I sometimes wonder whether it’s hard for me to write about because it changed my life so profoundly in almost every way. I grew up in a working-class environment in Scotland. My grandfathers were coalminers, my father worked in the shipyard. The notion that people like us went to Oxford University was frankly laughable. And that’s the reaction I got when I told my family and my teachers I wanted to sit the entrance exam. They laughed. Either that or they scolded me for over-reaching arrogance. But the one thing I had learned at the knee of my grandfather, a life-long socialist, was that I was as good as anybody else. I knew education was the escape route, and I was determined to take the high road. To everyone’s astonishment, mine included, I was accepted at St Hilda’s, then one of only five out of thirty-nine colleges where women could be educated. It says a lot for the tutors at St Hilda’s that they could see beyond the callow brashness of my sixteen-year-old self and recognise some quality they could work with. Arriving to take up my place in the autumn of 1972 was a culture shock of profound proportions. I’d only ever been in England once before, on a family holiday to Blackpool when I was twelve. Blackpool to Oxford is a bit like Las Vegas to Harvard. My principal initial problem was that people literally couldn’t understand a word I said. I had a Fife accent you could cut with a skean dhu, and like most Fifers, I also spoke very quickly. The first thing I had to learn was how to speak a form of English that was comprehensible. It might not sound like such a big deal, but for me it felt like being cast adrift without roots. I survived that first trauma but I learned a lot about what it feels like to be deracinated and the need to assimilate, both invaluable lessons for a writer who wants to understand character and who needs to reproduce dialogue with a degree of verisimilitude. Once over the communication hurdle, I threw myself into Oxford life without reservation. I worked hard, though never hard enough to convince my tutors I was doing myself justice. I learned how to read, how to think for myself and how to research with minimal effort, also lessons that have stood me in good stead as a writer. But I also played hard. I was involved in student politics, both at college and university level. I became President of the Junior Common Room (the undergraduate body) and fought battles on issues as diverse as new washing machines and the necessity of extending women’s opportunities within the university. I was instrumental in setting up a college newsletter. I wrote poetry which was published in various extremely small magazines. I partied as if born to the breed, and made friends who are still close today. I helped produce the first Real Ale Guide to Oxford, taking a vigorous part in the necessary research. I discovered feminism and, along the way, found the courage to come out. And all of this in one of the most beautiful and dramatic cities in the world. For Oxford truly is a university that lives up to its mythologies. I lay in punts on summer afternoons drinking champagne and eating strawberries. I got up at dawn on May morning to stand under Magdalen Tower and listen to the choristers greeting the summer. I toasted crumpets in front of gas fires. I ate formal dinners in several men’s colleges—we had a grading system of men one would go out with, based on the quality of their college cuisine. Everybody wanted a St John’s man, nobody with a taste-bud would be seen dead with anyone from Keble. I watched open-air Shakespeare in college gardens. I danced at a May Ball until breakfast. And I often sat up till the small hours deep in passionate discussion about the philosophy of language or the morality of science. I remember the day Richard Nixon resigned. I had spent the afternoon reading in a hammock in a garden in Park Town (the crescent street immortalised in Colin Dexter’s The Way Through The Wood), eating figs and drinking Italian wine, and we’d repaired indoors as the sun went down to huddle round the TV set and watch history being made. That’s Oxford for you. Always gets there first. Val McDermid’s A Place of Execution (St. Martin’s Minotaur, 2000) won the Macavity and Anthony awards for Best Mystery Novel. Her latest novel is Killing the Shadows (Minotaur 2001).